Sony is actually trying to promote this DVD! Click here for more info. Roughneckchronicles.com is now an Amazon.com affiliate, please order through their site. For R:STC related goods, check out the Roughnecks "store". First story arc, episodes 1~5. "Battling seemingly invincible forces primed to take over the universe, Roughnecks: The Starship Troopers Chronicles (The Pluto Campaign) is a state-of-the-art CGI feature length story that features elements of action, humor, coming-of-age, teamwork and fantasy." Amazon.com Editorial Reviews: Paul Verhoeven's dark, satirical adaptation of Robert Heinlein's Starship Troopers seriously strayed from the novel. This Verhoeven-produced TV series--part sequel, part remake, all CGI animated--hews closer to the spirit of the novel, a space-age twist on a World War II battle adventure. 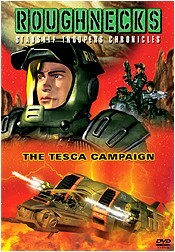 Roughnecks: The Starship Troopers Chronicles--The Pluto Campaign is a mini-platoon epic compiled from the initial eight episodes of the series, essentially a series of skirmishes and assignments leading up to the climactic confrontation at Bug City. The episodic nature works perfectly within this framework, and the mix of Marine grit ("No retreat, no surrender! "), military jargon, and understated melodrama give a feel somewhere between the steely seriousness of an old-fashioned war comic book and the spectacle and romance of a Japanese anime space opera. The excellent voice cast includes the inimitable E.G. Daly (who also contributes to Rugrats and Powerpuff Girls) as the gung-ho Private "Dizzy" Flores. Second story arc, episodes 6~10. "The Troopers are back for more non-stop action in the Emmy-nominated Roughnecks: The Starship Troopers Chronicles. In 'The Hydora Campaign,' Lieutenant Razak's fearless Troopers land on the aquatic Hydora planet hoping to find--and extinguish--the enemy bugs' home base. But soon, they're trapped inside a cave-like insect and attacked by swarms of gigantic, vicious mosquitoes. And when they find the terrifying mother insect who controls the bug universe, they realize its only intention is to kill off the entire human race. Now, the Troopers have found the source of the problem - but can they ever hope to control it?" Third story arc, episodes 11~15. "In 'The Tophet Campaign,' young journalist Higgins, fearless war hero Rico, and courageous female Trooper Flores land with their fellow soldiers on a desert planet. They meet a group of humanoid Skinnies who make them feel strangely at home--until gigantic killer bugs appear. Lieutenant Razak accepts help from a newly designed Trooper robot, who quickly saves the team from an intense ambush of massive crawlers. But the Skinnies have more than one surprise in store for the Troopers, proving again that the universe-wide bug war is far from over." Fourth story arc, episodes 16~20. "On the jungle planet Tesca, the Roughnecks confront a whole new array of bug soldiers, including web-spewing spiders and sea-based water tigers, as well as their own prejudices. Their newest squadmate is an alien and a former enemy, and a marine is not quick to forgive." Episodes 21-25, the 5th "story arc", called the "Ice Asteroid", has not yet been released. Sony has made no announcements as to when or even if they will. This would be the only one left to release. Episodes 33, 38~40 were never produced, so we will never see them. The others were "clip shows" and will not be released. Sixth story arc, episodes 26~30. Seventh story arc, episodes 31~37. The images and information contained herein are Copyright their respective owners. No images may be captured, copied or used with out permission.